Easy PDF Text Replace 1.0 Free Download - Professional software to edit text in PDF efficiently! Professional software to edit text in PDF efficiently! Last Updated: 8/16/2012 | File Size: 2588 KB | Price: $35 | Downloads: 112 | Developer: Easy PDF Tools Ltd.
Easy PDF Text Replace enables you to replace the unwanted text in the PDF file with new text, or just delete the text unwanted. Also you can exert the same configuration on different files to release you from repetitive business and add several unwanted text to be replaced at the same time. Easy PDF Text Replace is quite easy-to-use, what you should do is to input the text you want to replace within PDF file, and to input the text you want to replace with. 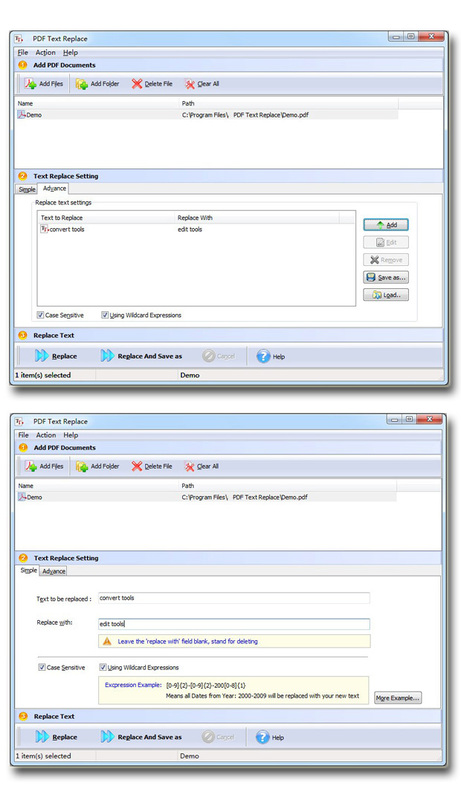 Then Easy PDF Text Replace will automatically recognize and replace the unwanted text in PDF for you. And you will be really impressed by its high efficiency even dealing with a large number of PDF files. Statement: First, please download the orginal installation package by clicking the download link. Of course you may also download it from the publisher's website. Using Easy PDF Text Replace crack, key, patch, serial number, registration code, keygen is illegal. The download file hosted at publisher website. We do not provide any download link points to Rapidshare, Hotfile, Depositfiles, Mediafire, Filefactory, etc. or obtained from file sharing programs such as Limewire, Kazaa, Imesh, Ares, BearShare, BitTorrent, WinMX etc. Software piracy is theft. If you like Easy PDF Text Replace please buy it.